Red Devils Football - Back to Back Division II Champions! 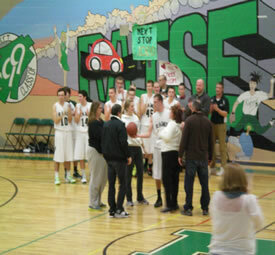 The stands at the Friday night, January 18, Raymond High School basketball game were filled to the outer edges with everyone waiting for senior Jordan Richard, number 23, who has played for four years, to complete 18 points in the game, giving him his long awaited career 1000 points. The first score on the board was made by the visiting team from Farmington. The scores continued to increase back and forth with Farmington in the lead. 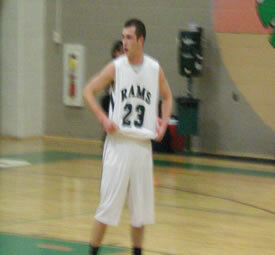 At the end of the first quarter it was Farmington 19, Rams 16. At 2 minutes 10 seconds left to the second quarter, the Raymond Rams tied the game 24 to 24. With only one minute fifty seconds left to the third quarter, Jordan Richard succeeded in achieving 1000 points by sinking a two point layup shot, pushing the Rams ahead to 44 points, Farmington 39. Family and friends ran off the stands to hug and congratulate Richard, and take photos before letting him return to the game. The fourth quarter was aggressive and tense, resulting in many foul shots and a few technical penalties as the Rams tried to widen the lead and Farmington tried to regain the lead. Both teams continued to take 3 point shots but missed most. 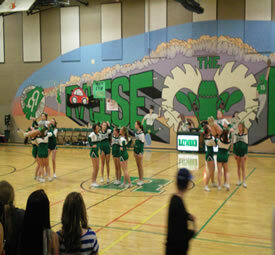 During the last two minutes of the game, with only a two point spread, the score was 60 to 58, with the Rams ahead. The Rams kept control of the ball, adding 2 points to their score five more times, with the final foul shot at 4.3 seconds on the clock bringing them to a solid victory, Rams 71 to Farmington 59. The Tuckaway Tavern hosted a fund raiser, on Saturday September 8th, to benefit the Nor-Rock Viking Football team and the Cheerleader Squad. 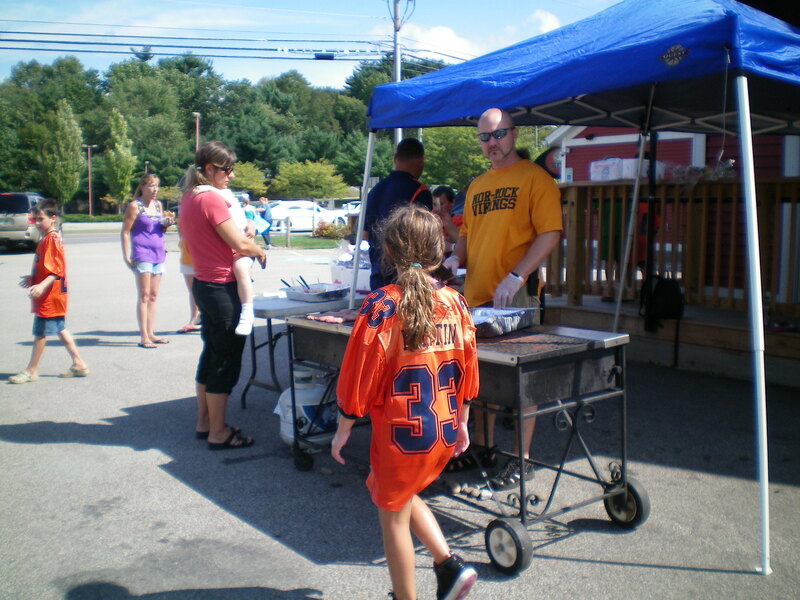 The community came together in the parking lot of the tavern from 10 am to 2 pm to wash cars and flip burgers donated by the Tuckaway Tavern & Butchery. Cheerleaders Amber George and Mckenzie Mcnutt held signs trying to encourage everyone to pull into the car wash. Steve Potter kept the boys washing the cars till they were spotless and shining clean. Football games were going on at the same time, so the football team members and cheerleaders had split shifts between the field and the car wash. The football team collected over $700 from the sale of the $2 cheeseburgers and scrubbing down dirty cars. Congratulations to Raymond Track and Field! The 9 and 10 year old Relay team from Raymond came in 2nd place for the state of NH at the Hershey Track and Field on Friday, July 6th. 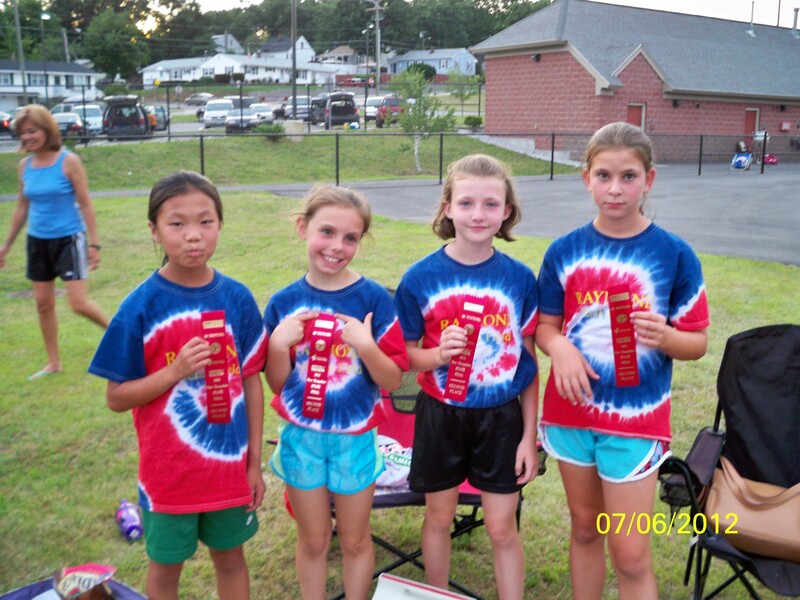 The relay team consisted of Madilyn Robinson, Hannah Reardon, Jeni Plender and Kathryn LaCasse. U16 Girls win Presidents Cup !! Raymond Soccer Club’s U16 Girls competitive team won the NH Presidents Cup on Saturday April 14th, with a solid win against the Seacoast United Soccer Club’s U16 Girls team. It was a 4-0 win. The game was 0-0 at halftime. Raymond came out strong the second half and started putting the ball in the back of the net. The Presidents Cup is a national tournament under the United States Youth Soccer organization. Winners of the state associations go on to compete in the National tournament which is being held in New Hampshire this year on Memorial Day Weekend. 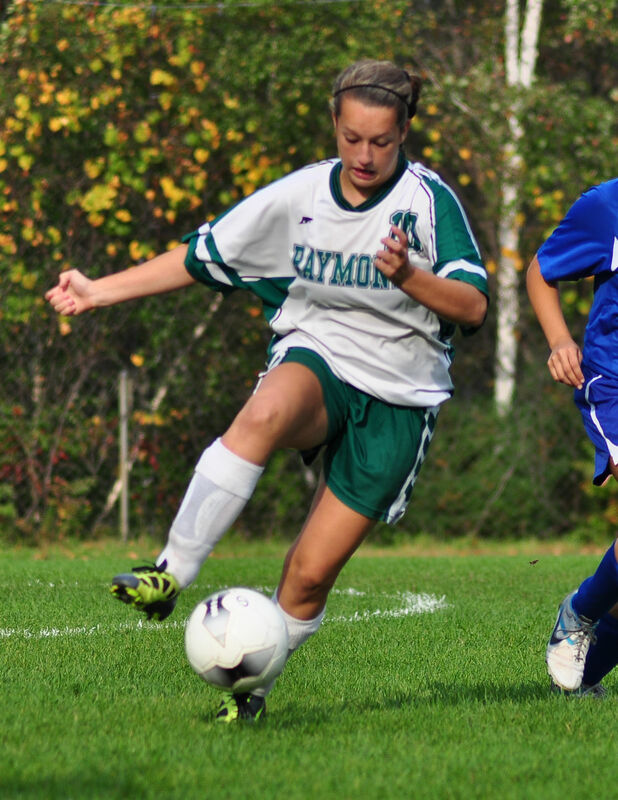 The Raymond Soccer Club is excited to have our team represent NH in the U16 Girls division. We are hoping that there will be a show of support for the team since the tournament is taking place in our own back yard!! 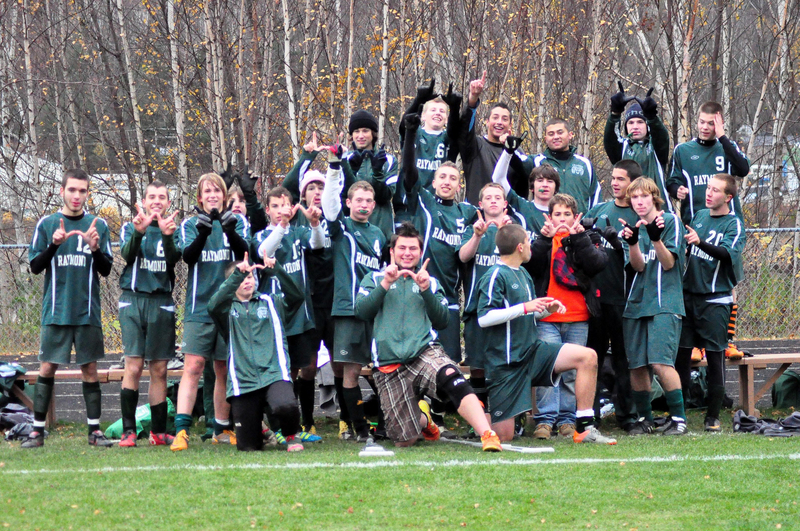 Against all odds, the Raymond Boys Soccer team will face Bow High School in the State Championship match on Sunday, November 6, 2 p.m., at Southern NH University. 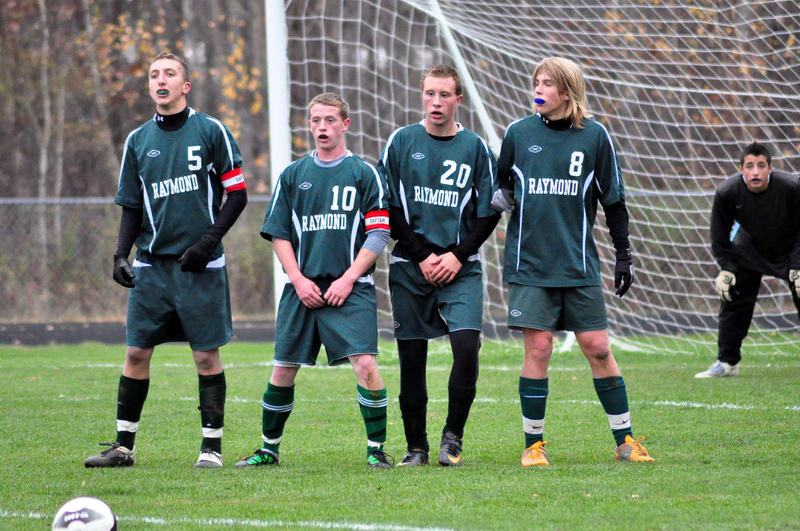 To recap, the Raymond Boys started in 15th place going into the NHIAA Division III playoffs. 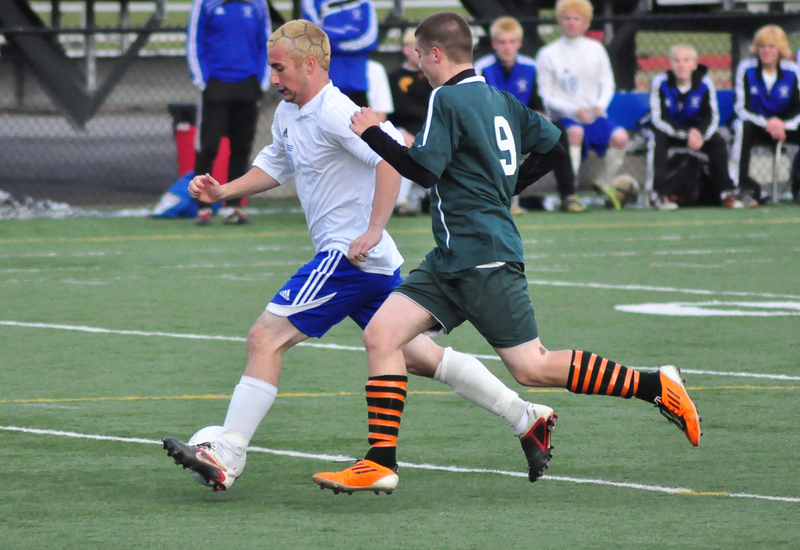 The first game against Farmington ended with Raymond scoring a single goal in the last 5 minutes of the game. The team moved on to face 2nd seeded Berlin and after 80 minutes of regular play and two sudden death overtimes won the game 1-0 on a direct kick. On Tuesday, November 1st, the team advanced to the quarterfinals at Exeter High School. The boys faced off against 7th seeded Campbell. The game was scoreless for the 1st half as Raymond defenders seniors Connor Mele, Collin Spinney, and Devon West-Coates assisted Goalie Brandon Vandewalle in successfully blocking all of Campbell’s attempts on the net. Sophomores Nick Cramer and Tristan McManus joined seniors Tyler Peer and Ben Sytulek in controlling the midfield and keeping the pressure on the Campbell players. It appeared that the game would advance to another double overtime when, with 4 minutes left in regular play, senior Camden West Coates scored with an assist from junior Devon Greer. The boys returned to Exeter on Thursday November 3 to match up against the 3rd ranked Guilford HS team. Guilford pressured the Raymond goal and successfully landed in the net with a direct kick over Goalie Vandewalle’s head. It appeared as Raymond’s run was almost over until the 2nd half of the game. With less than 15 minutes left in regular play, midfielder Connor Mele struck from the left side of the goal sailing the tying ball into the net pocket. The game moved into double sudden death overtimes with no score for either side. Freshmen Tucker MacPherson and William Harmon were blocked at every shot they took on net. Senior Camden West Coates played with a broken arm for 5 minutes after the Guilford goalie grabbed his legs in a net take down. After more than 120 minutes of regular and overtime play, the game advanced to a shoot out. Guilford goalie successfully blocked the first shot by Tyler Peer, while Raymond’s keeper Vandewalle was unable to stop the 1st shot by Guilford. The next three shots for Raymond were landed by Seniors Ben Sytulek and Devon West Coates as well as freshmen Tucker MacPherson. Vandewalle let in two more goals before stopping the 4th shot on goal. The shootout was tied 3-3 when in the fifth and final shot on net was made by Connor Mele. The crowd held their breath and Goalie Vandewalle blocked the last attempt by Guilford on his goal, sending the Raymond team to victory and Sunday’s championship game. 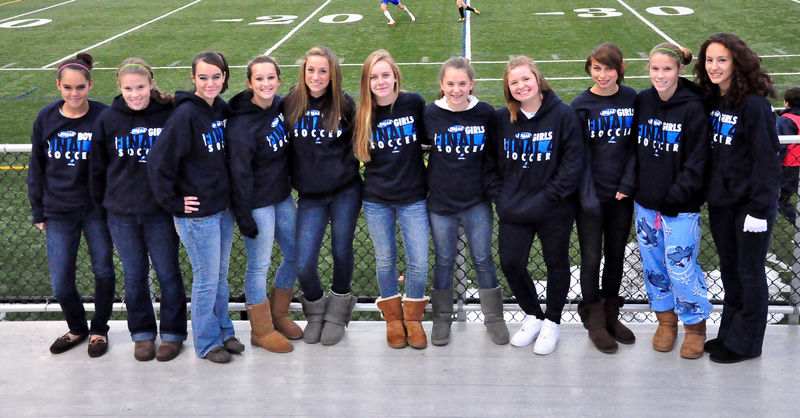 The Raymond Girls Soccer team fell against Campbell in the semifinal play on Wednesday night. Although the game was scoreless for the first 60 minutes due to the phenomenal efforts of keeper Kendra Shaw, Campbell’s pressure eventually resulted in an outside shot that sailed past defenders Senior Ashley Lord, junior Virginia Harmon, sophomore Mckenna West Coates and freshmen Sabrina Sweeney. The girls, who had started in 16th place, had claimed victories against Monadnock, White Mountains and Fall Mountain High Schools. Raymond will lose several key players to college play next year. Graduating include Abbey Schlangen, Nicole Lee, Kendra Shaw, Carlie Hester, Ashley Lord, and Danelle Sullivan. Submitted by Colleen West Coates. In a series of upsets, both the Raymond Boys Varsity and Girls Varsity teams have advanced to the third round of the NHIAA Quarterfinals this weekend. The winning streak began on Sunday, November 23 in the first round of playoffs. The Girls team traveled to 11th seeded Monadnock. The match was even until the last minute of the first half when junior Ameyla Vandewalle scored for Raymond. 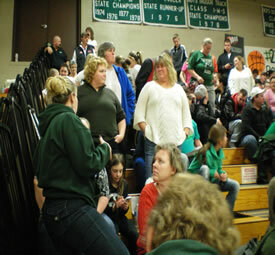 The second half began to tip the scales in the favor of the ladies from Raymond. Hannah Keefe (sophomore) scored at the beginning of the second half followed closely by a deal sealing goal by freshmen Mackenzie Philibert. Monadnock was not able to get any balls past senior Kendra Shaw and the game ended 3 to 0 in Raymond’s favor. At the same time, the Raymond Boys (seeded 15th) hosted Farmington in their first round of playoffs. The teams were evenly matched as neither team scored in the first half. 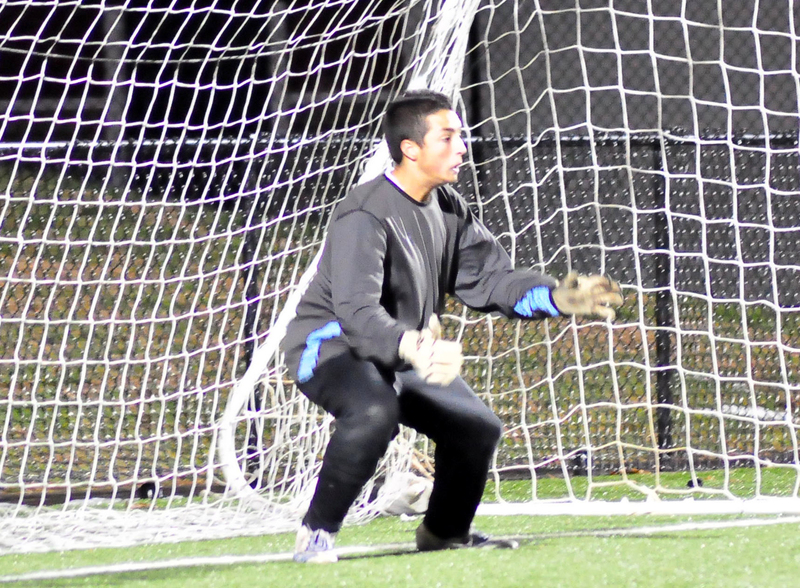 Goalie Brandon Vandewalle (twin to Girls varsity striker Ameyla) shut out any goals from Farmington. The game was decided in the last five minutes of the second half when senior Camden West Coates scored off a rebound shot from freshmen Tucker MacPherson. The teams then faced long road trips to compete against White Mountains Regional High School (girls) and Berlin High School (boys). The Raymond Girls team, ranked 14th, took on the fourth seeded White Mountains HS. 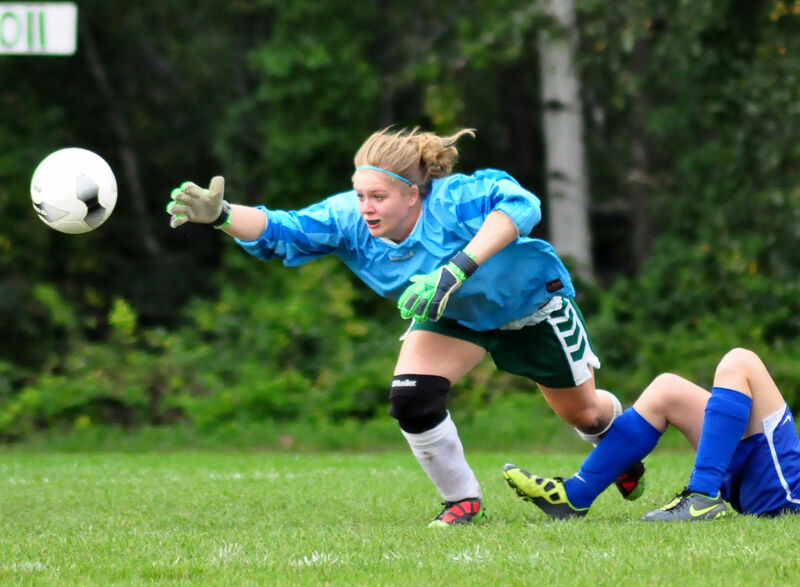 White Mountain was only able to get one shot in the net but the Raymond girls countered and prevailed by sailing 3 goals past their opponent’s goalie. Striker Amelya Vandewalle scored twice, one in each half of the game and freshmen Danielle McNicholas scored the 3rd goal to bring Raymond to victory. Stopper Sabrina Sweeney and Sweeper Ashley Lord were assisted by the defensive team of sophomore Mckenna West Coates and Meredith Reed as well as seniors Danelle Sullivan and Carlie Hester. 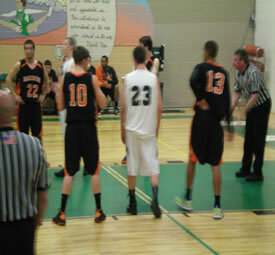 On Thursday, the boys endured a 3 hour trip to face second place team Berlin High School. The game was a nailbiter that left the fans of Raymond breathless. 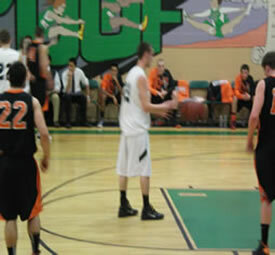 Neither team scored during regular play and the game progressed into a sudden death double overtime. Sweeper Devon West Coates assisted goalie Brandon Vandewalle by stopping five goal attempts from hard hitting Berlin. Sophomores Nick Cramer and Kamin Sylvia worked with Seniors Collin Spinney, Tyler Peer and Ben Sytulek. Midfielders Pat MacDonald and Mike Schillereff contained Berlin’s outside attack. 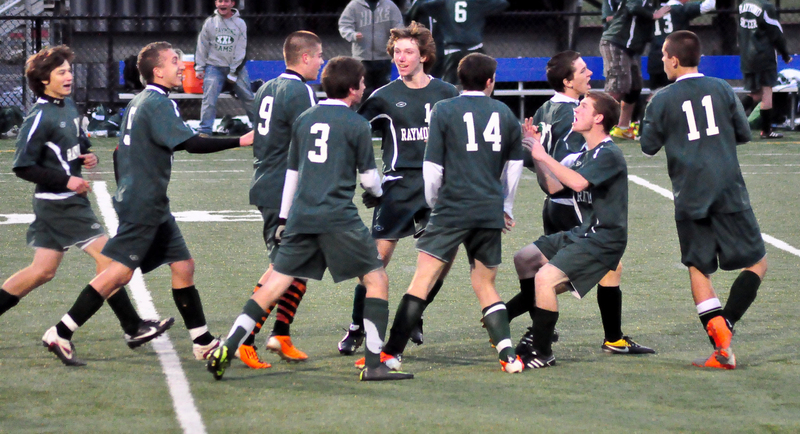 Connor Mele ended the sudden death overtime with a direct kick into the goal. Boys Team after their WIN at Berlin !!! 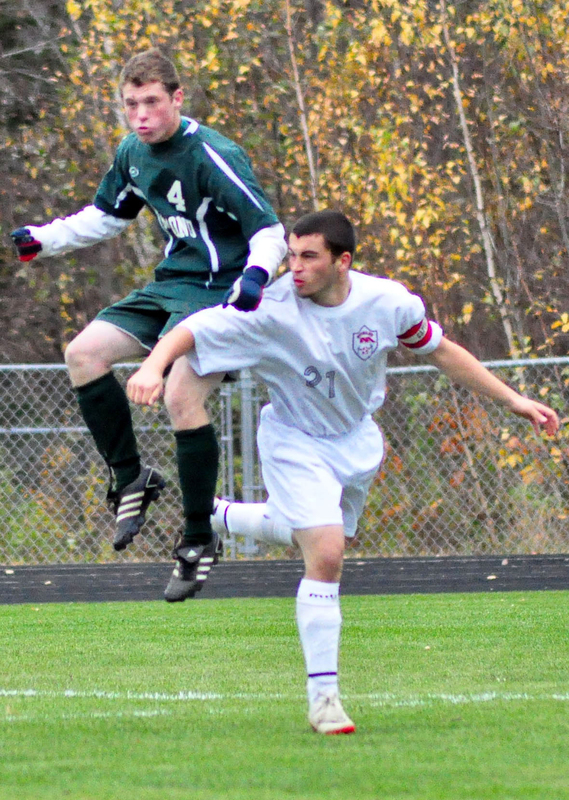 The Raymond teams continue onto the 3rd round of the NHIAA playoffs this weekend. The girls face Fall Mountain HS on Saturday October 29 in Langdon NH. The boys will face Campbell HS in Litchfield at 2 p.m. on Sunday October 30th. If one or both of the teams prevail, they will move onto the semifinals in Exeter on Wednesday and Thursday nights, respectively. Twins are highlighted in the Raymond teams this year. Senior twins Camden and Devon West Coates play for the boy’s team, freshmen Hannah and Danielle McNicholas both start on offensive line of the girl’s team. Twins Brandon and Ameyla Vandewalle represent their families on both teams.